In response to last week’s survey, we’re adding a Tumblr blog to Speed Force. Like the Facebook Page and Twitter stream, it’ll automatically pick up updates from the main site, plus there’ll be link & photo sharing and occasional short commentary that fits better on Tumblr. We’re still settling in — and still working out the kinks in the cross-posting — but feel free to stop by, check it out, and if you see something isn’t working quite right, please let us know. This entry was posted in Site News and tagged Social Networking, Tumblr on June 30, 2011 by Kelson. Speed Force contributors Devin “Flash” Johnson and Greg Elias take a look at last week’s Flashpoint: Reverse Flash one-shot, written by longtime Flash artist Scott Kolins and illustrated by Joel Gomez, with colors by Brian Buccellato. This entry was posted in Reviews and tagged Barry Allen, Flashpoint, Group, Joel Gomez, Professor Zoom, Reverse Flash, Scott Kolins on June 29, 2011 by Greg Elias and Devin. Journeys Exclusive Converse Flash Chucks Have Arrived! About a month ago popular shoe retailer, Journeys announced that Converse and DC Comics would be teaming up again to release another round of DC Comics inspired Chuck Taylor’s (or just Chucks) with five of them being Journeys store exclusives. Out of the five exclusives we finally got a pair of official Flash Chucks. I preordered my own pair a month ago and they finally arrived yesterday. This entry was posted in Collectibles and tagged Chuck Taylors, Flash Converse, Journeys on June 28, 2011 by Devin. Comic Book Resources posted a 3-page preview of Flashpoint: Green Arrow Industries, a one-shot due in stores this Wednesday. 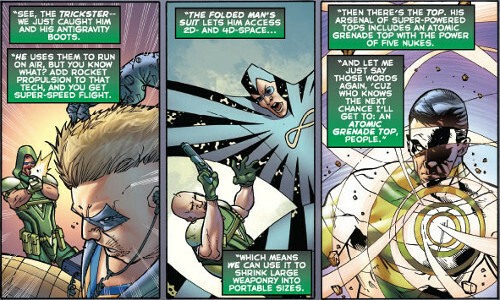 Of possible interest to Flash fans: These panels, in which Oliver Queen explains how they studied equipment confiscated from super-villains and used it to improve their own weapons technology. It’s a counterpoint to an idea that comes up occasionally in reference to high-tech villains: Why don’t they just patent their inventions and rake in more money than they could possibly have made on bank heists, without worrying about getting beaten up and thrown in jail? The answer is usually that they do it for the thrill…but then why doesn’t anyone else come up with business uses for the technology? Chances are these one-panel appearances are all we’ll see of these villains in that particular issue (though we’ve already seen more of the Trickster in Flashpoint: Citizen Cold), but it’s interesting that all three of them are Flash villains: The Trickster, the Folded Man, and the Top. This post has an “Atomic Top Grenade” value of 3. This entry was posted in Flash News, Out This Week and tagged Flashpoint, Folded Man, Green Arrow, The Top, Trickster on June 28, 2011 by Kelson. Starting in July, DC Comics Retroactive series will bring back classic creators to the characters they helped define. Covering the last three decades of the 20th Century, the three Flash issues will feature writer Cary Bates (1970s), writer William Messner-Loebs and artist Greg LaRocque (1980s), and writer Brian Augustyn (1990s). 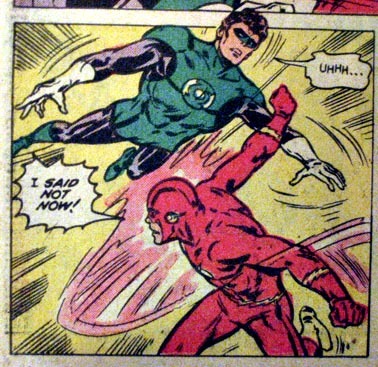 LaRocque was the penciller on Flash for the entirety of Messner-Loebs’ tenure from 1988 – 1991, and illustrated a portion of Mark Waid’s run including the classic “Born to Run” and “The Return of Barry Allen”. In all, LaRocque pencilled nearly 60 issues of Flash over a five-year stretch. This entry was posted in Creators, Interviews and tagged 1980s, DC Retroactive, Greg LaRocque, Interview on June 27, 2011 by Greg Elias.